Shlomit Ofir designs this beautiful, thick chain gold necklace with filigree closure accent piece. Israeli designer Shlomit Ofir re-imagines the classic gold necklace and comes up with a stunning, unique take on a traditionally simple piece of gold jewelry. In this necklace, Ofir diverges from her customary delicate chains in favor of a thick, smooth gold plate necklace chain. The strong gold chain is accented by a snowflake medallion crafted in filigree. 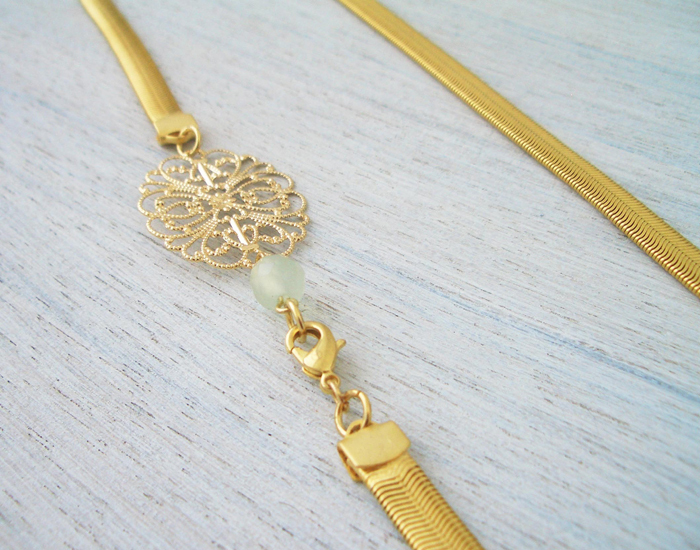 The ornament is made of brass and plated with 24 karat gold, set off by a medium-sized Czech glass bead in a quiet shade of pale green next to the clasp, which fastens on the side rather than at the back of the neck. Ofir's eye-catching design will appeal to lovers of unusual jewelry. The gold plated filigree element measures.91 inch (2.5 cm). The chain is.18' wide (4.5 millimeters), and the total length of the necklace is 26 inches(66 cm). Shlomit Ofir's jewelry designs bring timeless style together with a contemporary feel in handmade jewelry and make excellent gifts. Her gold and silver plated pieces will complement and collection of modern handmade Israeli jewelry and accessories.